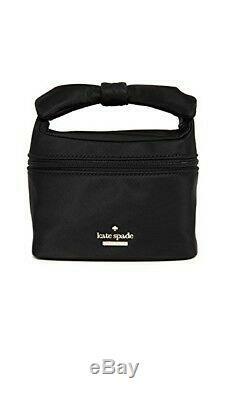 KATE SPADE HARING LANE JOLIE BLACK TRAIN CASE COSMETIC CASE SET WITH TOP BOW HANDLE. Brand new Kate Spade Haring Lane Jolie Black Train Case Cosmetic Case Set with Top Bow Handle and tags. Includes 2 matching Cosmetic Cases in 2 Sizes. Brand new Kate Spade Cosmetic Case Style # PWRU5684. Haring Lane Jolie Train Case Cosmetic Case Set in Black Twill coated fabric with matching leather trim. This Set has 2 matching Cosmetic Cases in 2 convenient sizes. There is a Large Train Case Style Cosmetic Case. There is a Small Travel Cosmetic Case. Each Cosmetic Case is constructed of a Black Twill Nylon fabric with a protective clear PVC Coating for easy care and maintenance. Each has the signature polished 14K Yellow Gold-Dipped Hardware. Each Case has a Kate Spade signature and logo on the exterior front. The Train Case Style Cosmetic Case measures 9 inches wide x 6.5 inches high x 7 inches deep. It is a Top Zipper Entry Case with dual zippers that sit at the top collar of the large base. The dual zippers open independently from the front center of the Cosmetic Case to the back wall hinge. Each zipper has a black leather zipper pull. The matching Bow on the top is the handle for this Cosmetic Case. The Bow is adjustable and may be re-tied for a more comfortable fit for the fingers in the available space. Interior silver nylon wipeable lining for easy care and maintenance. Interior lid has a zipper pocket to hold small items. The base is divided into two large sections. The matching Travel Cosmetic Case is packaged in one of the base sections. An open slip pocket is on the back wall of the base. The Travel Case is a Top Zipper Entry Cosmetic Case. The zipper opens from the midline of the left side up and over to the to the midline of the right side. This zipper style provides a complete view and complete access to the interior of this Cosmetic Case. Measures 8.5 inches wide x 3.5 inches high x 3.5 inches deep. Interior silver wipeable fabric lining for easy care and maintenance. The Travel Case will fit inside of a handbag, a backpack or a travel bag. This Haring Lane Jolie Cosmetic Case Set is a very attractive design. With 2 Cosmetic Cases in two popular sizes. Each Case has a spacious interior with room to meet your storage and organization needs. The Train Case can store your cosmetics at home. The Travel Case is a perfect size to carry your cosmetics with you. It can be used for this purpose at home or for travel. The Travel Case will fit in a handbag, a backpack or a travel bag. This Cosmetic Case Set will provide the space you need to manage your cosmetics and tools both at home and away. This Kate Spade Cosmetic Case Set is a great design with 2 Cosmetic Cases in 2 sizes. There are 2 Cosmetic Cases in 2 Perfect sizes to handle your storage and organization needs. It is a wonderful Kate Spade Cosmetic Case Set. The item "KATE SPADE HARING LANE JOLIE BLACK TRAIN CASE COSMETIC CASE SET With BOW HANDLE" is in sale since Thursday, December 27, 2018. This item is in the category "Health & Beauty\Makeup\Makeup Bags & Cases". The seller is "returntocalifornia" and is located in Gibsonia, Pennsylvania.